Fin-al-ly..The Peoples Eatery has Come Back (although it was never there to start with) to Spadina Avenue! 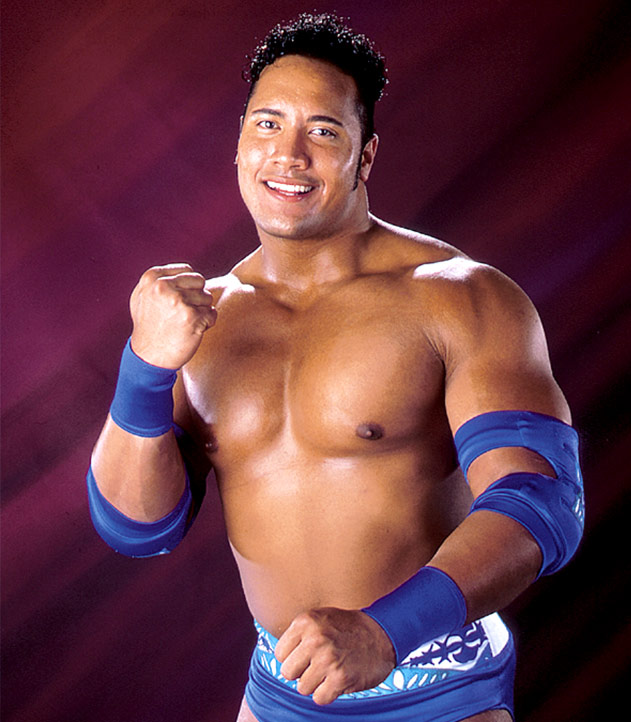 The first time I heard the name “peoples eatery” I couldn’t help but think of Dwayne “the Rock” Johnson. He used to step into the ring, grab a microphone and proceed to gloat and taunt his way through an electric monologue which began with “Finally, the Rock has come back to insert city,” and made numerous references to him as the “people’s champion”. He would also cite his “people’s elbow” finishing move so suffice to say he may appreciate eating at the people’s eatery. In fact, the name may be a reference to the People’s Republic of China given the menu features a spin on Asian fare in the heart of China town (there seems to be inconsistency about whether there is an apostrophe in peoples but the website suggests no) . As an extension of 416 snack bar, it has similar features in that it’s crammed into a tiny space (at least the downstairs is) and doesn’t see the necessity of utensils. It’s different in that the dishes are primarily inspired by Jewish and East-Asian cultures with a few other surprises thrown in. In addition, there is the option of a tasting menu designed by executive chef Dustin Gallagher and his culinary team. I arrived to be greeted by well-coiffed waitstaff with a pretension reminiscent of Rocky Maivia, Johnson’s pre-rock persona. They offer a small but impressive list of local beer featuring breweries like Left Field and Neustadt for around $7. I inquired about the list and had the choices on the menu described to me. Ten minutes later, the same guy had a conversation with a co-worker behind the bar raving about the new beer they just got that wasn’t on the menu. I was a little perplexed as to why this was never mentioned to me. The Peoples Eatery in a true snack bar. Most things on the menu are under ten bucks unless you want quail or peking duck. I got the “small plate” speech which was a predictable as the Rock saying “Jabroni” during one of his heated wrestling rants. I ordered a bunch of dishes with the knowledge they would arrive as they were prepared and ready from the kitchen. Speaking of the kitchen, there is an open prep area for cold foods beside the bar and an open kitchen for hot food in the back. 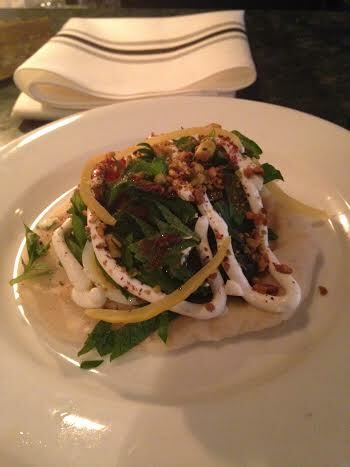 The first dish to arrive was a twist on the Jewish Sabich (pita with quail egg and herb salad) for $7. The abundant filling made it a bit tricky to eat and was accented with pickles, a tangy dressing and a creamy sauce. The flavours were good but it lacked a little substance, especially for seven bucks. 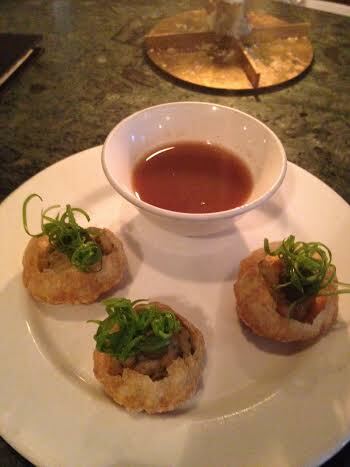 Next to arrive was the panipuri ($4). Also called waterbombs, these bite size morsels fizzled more than they exploded although the dipping sauce added a sweet, tangy and sourness which accented the bombs greatly. The General Tso-fu should be ordered just for the name. It’s tofu….done General Tso style. It was arguably the best thing I ate all evening. 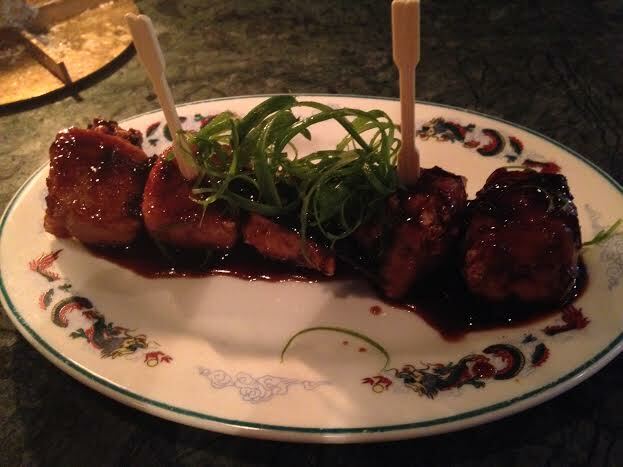 The silkiness and temperature of the piping hot tofu coupled with the cooling yet spicy sauce balanced perfectly. 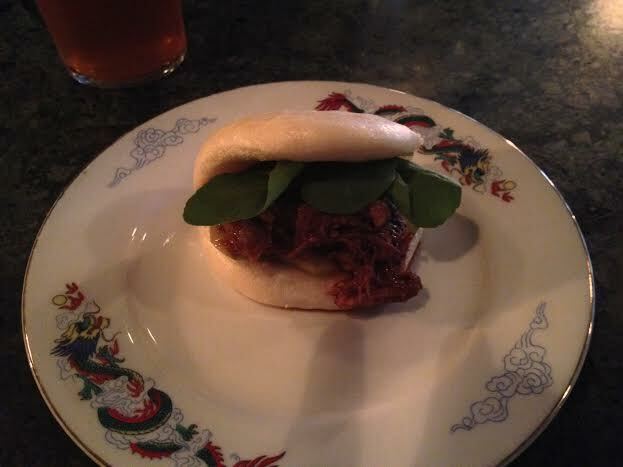 Char Shiu Boa (aka pork buns) may be the new taco. Although surprisingly simply, there are many interpretations of this traditional Chinese dish. The people’s version is a transfer from 416 snack bar and more reminiscent of the Momofuku staple as opposed to the standard dim sum version. It had that wonderful wonder bread mouth feel and taste which surrounded a delicious tender pork filling. Although I follow and accept the small plate doctrine of the restaurants I eat in, I felt it very strange that my oysters were served last. My guess is that either the waiter forgot until I reminded him or it takes longer to shuck 6 oysters than it does to prepare four dishes. I was interested in the oysters for two reasons; they were less than $3 bucks each (which is a novelty in Toronto in most cases) and the promise of traditional and untraditional garnishes. In this case, they were served with lime, a mignonette and a beet horseradish (which I suppose is a little unorthodox). 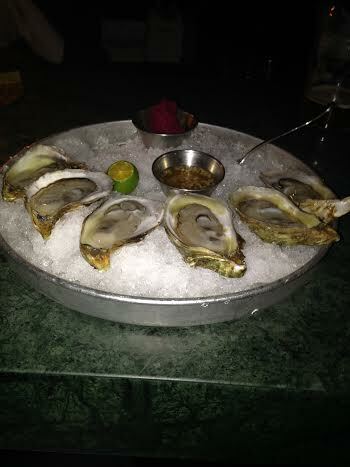 The oysters themselves were a nice size and shucked properly. 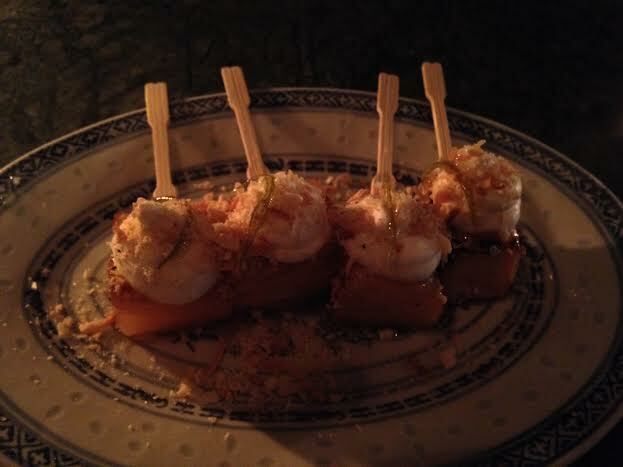 For dessert, I ordered the pineapple with coconut cream and lime. It was a refreshing finish to the meal but nothing remarkable. In general, I find the quality of pineapple inconsistent in general and this one was a bit on the sour side. Ok, the Peoples Eatery has never been on Spadina Avenue so technically it can’t come back but let’s stick with the wrestling analogy. First, we have the pretension of the staff which mimics that of the buff characters in the ring. There was certainly hipster muscle flexing going on. Second, like a wrestling match, the menu was well choreographed, offering both traditional and fancy moves contained within an entertaining evening. Finally, as a finishing move the dessert was more like Hulk Hogan’s lame leg drop as opposed to the Rock’s electrifying people’s elbow executed in front of the millions and millions of his adoring fans. In the end, the People’s Eatery is a decent but not spectacular sequel to 416 snack bar. I wouldn’t say it has the swagger of Wrestlemania but it would certainly be considered a good episode of Monday night raw…. if you smell what the Rock is cooking. Previous Post Another Susur experience: Would I thank this Luckee star?